The White-cheeked Turaco (Tauraco leucotis) is a Turaco that is found in humid forests; the highlands in Ethiopia, extreme South East Eritrea and Sudan. Throughout its range, it is commonly found from 2200-3200m, but has been observed at altitudes nearer 800m. Here this turaco frequents forest habitats, generally feeding on fruits and plant material. The species will also take arthropods, and insect-eating has been seen in captivity when pairs are rearing. The White-cheeked measures approximately 42-43cm beak to tail, and weighs between 200-315g. 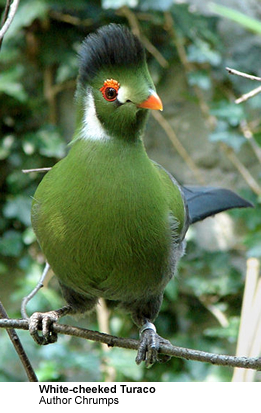 This turaco features a dark crest, with the sub-species - the Donaldson's Turaco, T.l.donaldson - differentiated by a pale crimson hind crown. The Hartlaub's Turaco (T.hartlaubi) has an orange bill and a broad white cheek lateral on the neck, posterior to the ear covert. 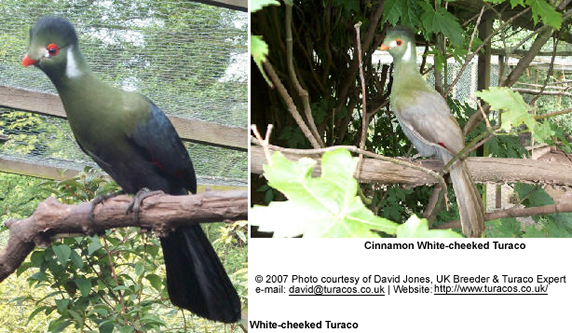 The White-cheeked Turaco is probably the most common turaco species kept and bred in captivity. It has gained popularity for its excited, dynamic behavior and attractive appearance, coupled with an affordable price for captive-bred specimens.